If you see that message in the Status and Results area(4), that means that JAF software is prepared to any operation. In this first step we are going to begin with the number 1, as usual. CNT, This file appeared long time ago in the new Nokia phones and has the media files, different from language areas and branded or unbranded versions. Each Nokia phone has a Product code which varies in language contained and brnded or unbranded version. The product code comes from Factory and can be found in the stick behind the battery. We use this function to rewrite the product code after flashing. Then the phone will be recognised as we want by Nokia Centers. -Below this option we have a new option(locked at this moment). If you press INF button, with a phone connected of course, we will have unlocked this feature. This feature looks theINI file of the phone you have connected. What is anINI file? The INI file it's a notebook file with extension *.ini that it's inside any Nokia package installed. This file is based in the different product codes that our phone has. The INI file will show us in the blocked area the country/Region name and if it's a branded version. When we will select a package of the list the software will look at the ini file selecting the necessary files to flash the phone. 1)Factory set: With this option marked the phone will be as it has left the factory at the end of the flashing process. 4)Manual flash: Using this function you can select manually the files that are going to be flashed. Also can be used when the software can't search the phone or the ini file. You must press Manual Flash and then Use INI. Then a list with all the Nokia phones will appear, select your and continue as a normal flashing. - AFP:This means After Flash Process. The process after flashing the main files won't be done(Factory settings or whatever). It's usefull if you have connection problem because the usual errors can be found in the AFP. - BT: Skip flashing bluetooth Area, it will skip this area because sometimes bluetooth adress can be damaged when flashing. .Load NFP it's used for non GSM phones and means MCU for this phones. .RPL 208 it's a part of the PM file that contains security info. 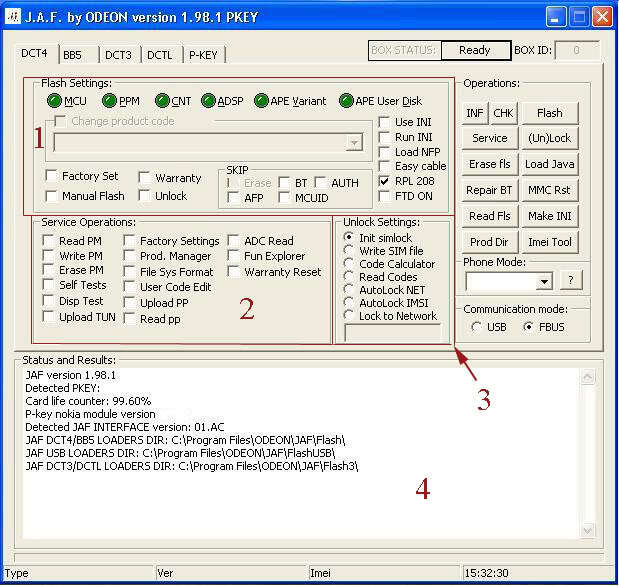 This should be always backup by JAF software in order to avoid IMEI problems. thanks a lot sir for this useful information.